From one period film to another. It's been a long time since I'd read The Scarlet Pimpernel. I'd first read the book when I unearthed it from my grandfather's dusty collection one childhood summer. It was the sort of tale that would enchant a child - the excitement, the danger, the history - especially one with a romantic bent of mind, like me. And it was romantic - a brave Englishman who courted danger to rescue French aristocrats in danger from the revolution (and I didn't like Robespierre one bit either), a hero who led a double life, a villain worthy of being fooled, fabulous dialogues... However, I'd never watched a cinematic representation of the novel. Recently, however, I came across two versions - one from the 30s and the other, a 1982 adaptation, which however, wandered away from the story quite a bit. (I'm somewhat of a purist, and prefer cinema adapted from literature to not take too many liberties with the story, especially when it tampers with history.) The acting was stellar in both versions, but I decided to review the version that was more faithful to its source material. It's 1792. In London, however, George, Prince of Wales, is watching the changing of the guard outside the palace, and doffing an imaginary hat to the citizens assembled to watch it. The news from the continent is darker, however - the execution of the aristocrats is continuing unchecked; over 50 of them were guillotined in one day. The Prince hopes the 'The Scarlet Pimpernel' can save some of the others before they meet the same fate. In France, an almost festive mood hangs over the crowds eagerly watching the hated aristocrats led to the guillotine in tumbrils. Here too, there is talk of the mysterious Scarlet Pimpernel, who is the only man who appears to have cheated Madame Guillotine of her victims. A group of aristocrats have been remanded to house arrest; here comes a priest (Bramwell Fletcher) in search of the Count de Tournay (O.B. Clarence), with a message for him from the elusive Scarlet Pimpernel. 'Courage' says the note, signed with nothing but a flower. But the hope that flares dies a quick death - a soldier comes in, bearing Robespierre's orders - he's sending a few more aristocrats to feed the guillotine; among the names is that of the Count de Tournay, his wife and daughter. Soon, a couple of soldiers come up to the city gates - they tell the captain that he's to check every cart that comes along, especially one that's driven by an old hag. The captain is taken aback - one such cart just passed through his gates half an hour ago; the hag said that the cart contained her grandson, who was suffering from the plague. The soldier is furious - the 'grandson' was actually 23 aristocrats snatched from the guillotine. And the old hag? 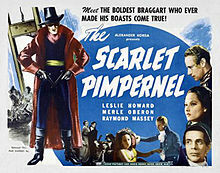 Well, she was the elusive Englishman known as the Scarlet Pimpernel! The soldiers storm out of the city following the trail of the Scarlet Pimpernel. As it turns out, they are all Englishmen, part of the Scarlet Pimpernel's band of courageous daredevils. Out in the countryside, the 'old hag' is met by another carriage driven by two well-dressed young men, and his human cargo is unloaded and carted away to safety, while 'she' makes her way back to the coast, removing the disguise to reveal himself as Sir Percy Blakeney (Leslie Howard). He has strict instructions for his brother-in-law, Armand St. Just (Walter Rilla), who will remain in France. Armand is to keep a close watch on Chauvelin, and if he goes to England, Armand is to follow him. Chauvelin is their most dangerous enemy. Meanwhile, Robespierre (Ernest Milton) is meeting Chauvelin (Raymond Massey). His instructions are clear - Chauvelin will go to England to discover the identity of the Scarlet Pimpernel. The Chauvelin is not so sanguine - how on earth is he expected to do so in a country that hates the standard bearers of the French Republic? As for arresting them in France, the Scarlet Pimpernel and his men belong to that class of Englishmen who speak French fluently. He's keeping an eye on some possible suspects, of course. Perhaps the Count de Tournay can help? Robespierre offers the Count a tempting offer - his family are already in London by now, rescued by the Scarlet Pimpernel, and if the Count wishes, he can follow them; all that is asked of him in return is a little information. The group of aristocrats are now toasting King George III and King Louis XVI in a little seaside drinking house called 'The Fisherman's Rest'. Mademoiselle de Tournay (Joan Sanders) is curious about the identity of The Scarlet Pimpernel. Sir Andrew Ffoulkes (Anthony Bushell), one of their rescuers, informs her that the Pimpernel is a wayside flower; the name masks the identity of one of the best and bravest of Englishmen. Now that she's out of danger, Mademoiselle de Tournay, like the very young, has shaken off her terror and is looking forward to meeting Marguerite, an old school friend, again. Her mother (Mabel Terry-Lewis) is furious - she doesn't want that name mentioned in her presence. When Sir Andrew questions her, Madame de Tournay informs him that Marguerite St. Just denounced the Marquis de St. Cyr to the Tribunal. He and his family were all sent to the guillotine. Does Sir Andrew know Marguerite St. Just? Andrew is aghast - all London knows Marguerite, Lady Blakeney. While all this is going on, the erstwhile Marguerite St. Just, Lady Percy Blakeney is sitting for her portrait. The artist, the renowned George Romney, is painting her, even as she and her friends discuss the Scarlet Pimpernel. Who is he? Her husband, Lord Percy, is meanwhile with his companions at the Blacks Club. They are discussing their recent rescue, and the difficulty involved in saving more people - thirty aristocrats were guillotined just that very day. If only they asked, every decent Englishman would join them, says one enthusiastic young man. True, says Lord Percy, and within a week, every single one of them will be a marked man. They have a difficult job to do - not just sit in the shadow of the knife while the guillotine butchers their friends and their families like cattle, but they need to mask their identities, pretend to be fops and cowards, and do the best they can to save as many lives as they can. Just then, a man enters the room, and Lord Percy changes tack, looking for all the world like the fop he pretends to be. The man, irate at having his name mistaken for the thousandth time, departs in a huff, amidst much laughter from Percy and his companions. Percy follows him, intend on having him listen to his 'masterpiece'. It came to him, suddenly, he claims, at the busiest time of the day - why, he was tying his cravat! The colonel's contempt is obvious. He makes his leisurely way back home after having offended the poor colonel, and then proceeds to irritate Romney by informing him that the portrait he's painting is 'a very image of her (Marguerite)' only Romney seems to have got the eyes, the nose and the mouth all wrong. (Actually, the portrait looks nothing like Marguerite, so I can't blame Lord Percy.) As the painter departs in a huff, Percy continues to play the languid gentleman, who thinks of nothing more than his cravat. When Marguerite returns from seeing off her guests, Percy is contemplating her portrait; there's something missing, he tells her, a look in the eye... Happiness, remarks Marguerite, sadly. Percy's expression changes, and one recognises the seriousness that underlies the pretence of frippery. But it's momentary; what on earth has she to be unhappy about? he queries. She's the most courted woman in London! But he does have some news that will make her happy again - her brother is coming to England. Marguerite is indeed happy to hear that. Meanwhile, Sir Andrew has safely landed on the coast with his refugees. What he doesn't know is that Cheuvalin and his men have also landed in Dover. Cheuvalin has also had a breakthrough. 'Marguerite St. Just', he breathes. He then leaves instructions - his man is to return to France, and when Armand St. Just lands on French soil, he's to be arrested at once. Armand is, at that very moment, with his sister, who wants him to remain in England. He shall stay here, she says, marry a nice woman, and have many children. She begs Percy to help her keep her brother safe. 'What has poor Armand done to be sentenced to matrimony?' asks an astonished Percy. A hurt Marguerite hastily leaves the room. Her brother consoles her, but leaves her with the knowledge that he's soon to return to France. However, Armand still questions his brother-in-law. Why is he so cold towards Marguerite? Does Armand remember Marquis St. Cyr? asks Percy. He had watched their execution - the Marquis, his wife, his son, the daughter, and it was his wife who put her there. Armand is shocked. So that is why Percy risks his life to save others - to make up for his wife's complicity! No, retorts Percy, back to being the dandy, it's sport! And off he goes to meet the Prince of Wales (Nigel Bruce). He has well established the persona of a man who cares for nothing more than the cut of a new coat. The cuffs should float and ripple, he tells Treadle, 'so that when his Royal Highness takes snuff, it will be a swallow's flight.' But behind that 'brainless, spineless' exterior lies a sharp brain. When the Prince leaves the room, the mask drops. He orders his men to have Chauvelin watched before following his Prince to watch a prize fight between Jackson and Mendoza. It is there that he's told of Chauvelin's whereabouts - the latter is with Marguerite. She refuses to be a spy for him, regrets having given him information about St. Cyr. Ah, says Chauvelin. But Armand was arrested for treason the previous day, and he has the proof of Armand's guilt in his pocket. If Marguerite wishes, she can redeem it - the name of the Pimpernel in exchange for that note. Chauvelin knows that the Pimpernel is expected to be at the Ball the next evening. Marguerite is just agreeing to his proposal - unwillingly - when Percy walks in to hear Chauvelin promise to give her the note as soon as the Pimpernel is arrested. Percy, well entrenched in his masquerade, manages to be offensive while pretending to be gracious. He also acts the fool, so well, he offends Marguerite as well as Chauvelin. When Chauvelin leaves, Marguerite tries to pump Percy for information - does he think Andrew Ffoulkes could be the Scarlet Pimpernel? Percy straightens up for a moment before sinking back into his languid self. Marguerite is not sure whether she can turn to him and so doesn't tell him of Andrew's arrest. 'What's the use?' she asks despairingly, when he asks her why she won't tell him what's wrong. The next evening the Blakeneys arrive at the ball. The Tournays, mother and daughter, are present there as well. So is Chauvelin. While Percy is taken away by the women, who all want to hear his new 'poem', Chauvelin warns Marguerite of what she stands to lose if he doesn't get the information he seeks. Chauvelin's spies are everywhere. One of them, disguised as a waiter, informs him that Hastings slipped a note into Sir Andrew's sleeves. Armed with that information, Chauvelin asks Marguerite to get him the note. Unwillingly, Marguerite does as she's told. Chauvelin keeps his promise to Marguerite and sends her the proof he had of Armand's guilt, thanking her for having helped him discover the Pimpernel's identity. What's Marguerite to do now? Will Sir Andrew help her? Will he even believe her? Can they save Percy and Armand and everyone else? And Chauvelin? He's an intelligent man, and a deadly one. What will he do to catch the Scarlet Pimpernel? He is equally convincing as the quick-witted Pimpernel, the suave nemesis of the French revolutionaries. It is to Howard's credit that he never lets us forget the keen mind behind the simpering aesthete who lives for the correct fall of ruffled sleeves. One of the best 'light' scenes involves Percy responding to Colonel Winterbottom, who despises him for being a fop; when Percy claims to have written 'a masterpiece', the irate colonel snaps. It says much for the dialogue delivery of both actors in the scene that this dialogue sparkles with the intended humour. Howard's scenes with Marguerite are, similarly, infused with what lies unsaid - his recognition of her treachery, her despair at his increasing coldness towards her. When she complains about his obsession with what she calls 'trivialities', he retorts, 'Can't rise over anything above three syllables, my dear, never could.' But when she bemoans that she may have sent 'a good man' to his death, he cautions her against falling in love with a phantom: 'For all you know, he's a married man deeply in love with his wife..." There's sadness underlying that quip. Howard's performance was beautifully understated, relying as much on his quicksilver changes of expression as on the dry wit of the dialogue (delivered with perfect timing) to etch two different characters with finesse. Merle Oberon as Marguerite looked distressed and worried - by turns. Exquisitely beautiful (at some angles, she resembles our very own Rekha - it's her face as well as her expressions), one can easily accept her as the pivot on whom the intrigue is based. 'Marguerite' actually suffered from the role being underwritten in film, given that she has a lion's share of the story originally told. (Orczy referred to her as 'the cleverest woman in Europe.') Yet, there are a couple of scenes where Merle Oberon shows what she's capable of, given a chance. In the scene where Percy mocks her for wanting her brother to marry - 'You of all people should know better than that,' he tells her, Marguerite leaves hastily. When her brother follows her, she smiles through her tears, 'I have the satisfaction of knowing that the biggest fool in England has the most complete contempt for his wife!' Her hurt is palpable. Raymond Massey played Chauvelin, a man dangerous not only because he's a revolutionary, but because he's also an idealist - he believes in the Revolution. He's the man handpicked by Robespierre himself to arrest the Scarlet Pimpernel. He is both intelligent and ruthless, and while the film's length cut some of the best scenes between Blakeney and Chauvelin, and what's left of the best lines go to Blakeney, it is interesting to see his controlled performance as the French diplomat. Witness the scene where Howard in his role as the effete aristocrat recites a silly poem about the Pimpernel - Chauvelin is politeness personified as he dryly remarks, 'I particularly like the use of that term - Frenchies.' Or the one where when he imposes upon Marguerite the need for her to provide him with information about the Pimpernel and she rues the consequences the one time she did: 'I'm sick of this sentimental twaddle about the poor persecuted aristocrats! Have you forgotten what they did to the poor defenceless peasantry for centuries?' He has a point. Where I do have a tiny peeve is that they condensed the novel, leaving out some of the - in my opinion - best bits. And the ending was changed, which was a let down. However, the movie flows well, the action crisp and fast, and so it remains a peeve. That aside, if you're looking for a swashbuckling adventure with lots of swordplay and action, The Scarlet Pimpernel is not for you. Most of the 'action' here is verbal. However, if you're in the mood for an exciting story filled with intrigue, well-directed and well-acted, do watch this film. A good print is available on YouTube.